Individual differences in sentence understanding exist in terms of speed, strategy and interpretation. In psycholinguistics experiments, these -sometimes small- differences are often treated as “noise” and considered meaningless. This dissertation focuses on such variation across individuals in the use of syntactic and semantic information in sentence understanding. 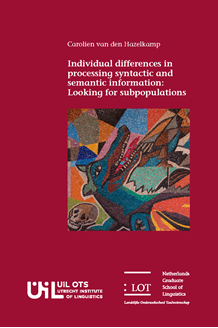 Two hypotheses explaining individual differences are put forward in a model of language processing that distinguishes a syntactic processing stream and a semantic processing stream: The Dominant Stream Hypothesis (DSH) states that the relative dominance of the two processing streams differs between individuals: in some individuals the semantic processing stream is relatively stronger while in others the syntactic processing stream is relatively stronger. The Individual Variation in the Status of Animacy (IVSA) – hypothesis states that some individuals process animacy information only in the semantic stream, while other individuals process animacy in both streams. The two hypotheses are tested in several experiments making use of self-paced reading, auditory and visual violation detection, and speed-accuracy-tradeoff paradigms. Results show that the specific patterns of performance predicted by the two hypotheses are only found to a limited extent. The data support the idea underlying the DSH that the strength of processing streams differs across individuals, but not that strengths of processing streams within an individual are related. Support for the IVSA hypothesis was found, though only in a small number of participants. The specific characteristics of experimental paradigms are of major importance, and the dissertation includes an in-depth discussion of methodological considerations in various experimental paradigms.